It was so hectic at work last week that my boss and I spent the last hour of Friday afternoon laughing deliriously that it was finally the weekend. Kinda like how you’ve just been through a marathon and you’re lying on the grass panting in relief. Only our marathon is not over so I’m bracing myself for the upcoming weeks before it finally lulls to a stop before Christmas. A quiet Sunday at home alone. Couldn’t resist buying a mini madeleine pan on Saturday. 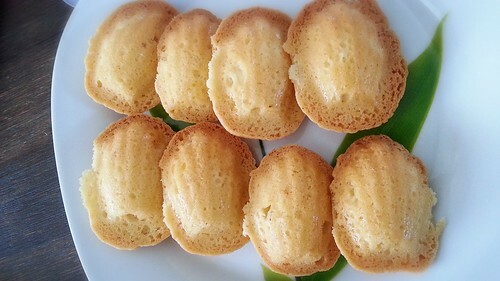 I’ve always wanted to bake Madeleines because I’m drawn to the pretty shell like shape. My niece loves picking seashells at the beach so I figure she might like these edible seashells. Jo just dropped by with 2 kilos of mussels so I guess we’re continuing on with the seafood theme for the weekend. Chilli mussels for dinner tonight? The first of this year’s Christmas cookie baking. I baked these almond crescents for the first time because Jan mentioned that she likes them. Love the texture of almond meal and the fragrance of butter and orange zest. Cookies always taste best when they’re straight out of the oven. 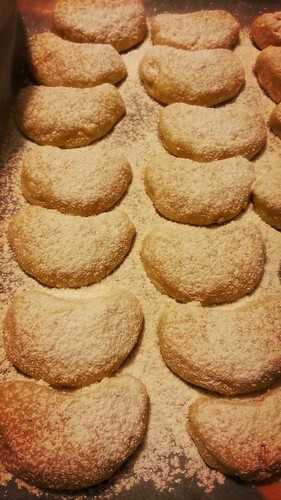 Will hopefully have more time to bake more Christmas cookies as the year winds down Y(^____^)Y. Maybe a gingerbread man for the kids? Noticed that I started a new category called Daitaoha Camping? 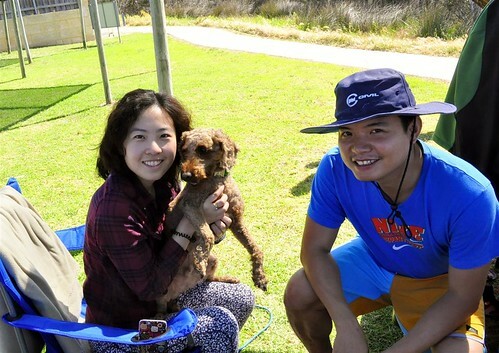 It’s because we actually had a good first time camping experience so I think we will probably go camping again in the future! 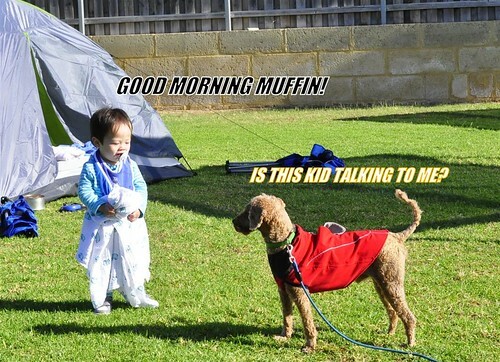 Haha, positive thinking. 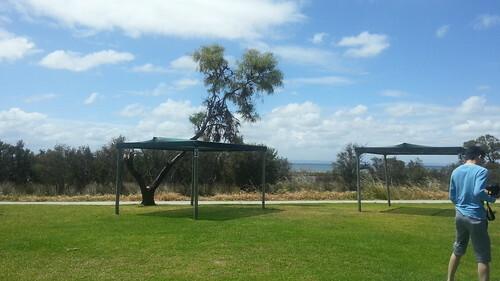 This was our camp site at Miami Holiday Park in Falcon/Mandurah. The caravan park was in a very convenient location (so near to shops and beach etc. ), was a powered site with full facilities so technically it wasn’t camping in the real sense but glamping (glamorous camping haha). Still, it was a good place to ease our way into real camping. 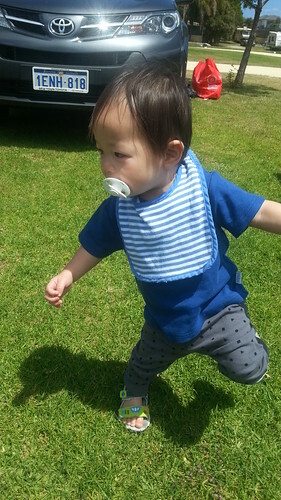 Tristan dancing away while his papa and uncle are hard at work putting at the tents. 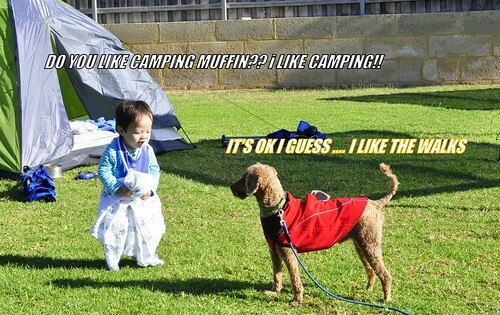 He loved camping from the get go and had a great time tripping over tent lines and running around in the grass. The tents are up! Not bad for a first try. 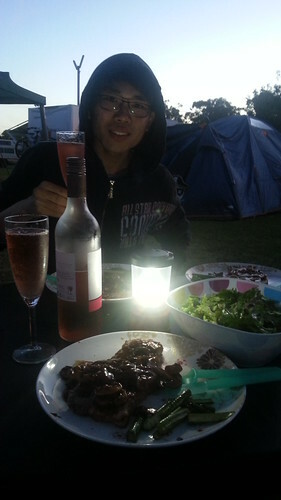 Our first camping meal. It was a simple steak with salad and asparagus. Next time we’re investing in an electric cooker because it took ages for us to heat up the pan on the gas stove because it was so windy! 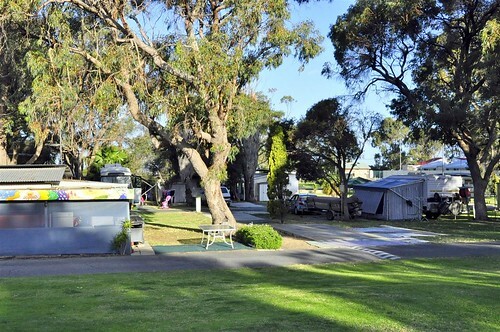 Our idyllic caravan park in the morning. I’ll be honest, our first night was rough because we were not prepared for how cold it would get in the wee hours of the morning, plus we obviously didn’t get our tent quite right because it was flapping so much in the wind that it kept us up. I reckon we probably slept two hours and I was very tired on the second day. The good news is, we re pegged the tents on the second day, Jan came with extra blankets and it was so much better. Revisiting Mandurah which is still lovely. 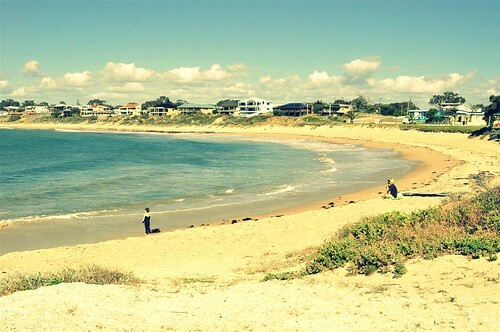 Going to the beach. 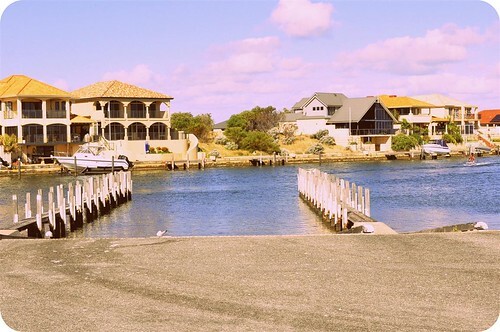 This is Falcon Bay. For some reason I had fanciful ideas of spending the day by the beach, reading a book and sipping a pina colada (ok, more like a Coke), occasionally dipping in the ocean. Alas, this trip reminded me that I’m not a beach person, the ocean was too cold and it was too hot by the beach to stay all day. 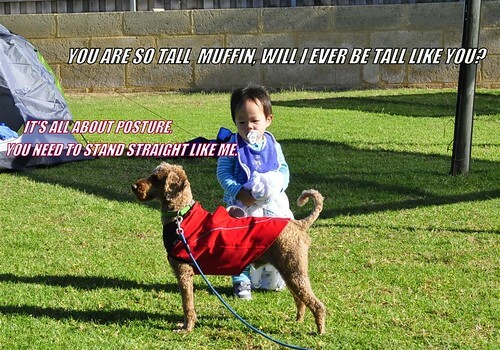 Witnessing a funny moment between Tristan and Muffin. In my imagination, they were having a conversation. It was kinda sweet. 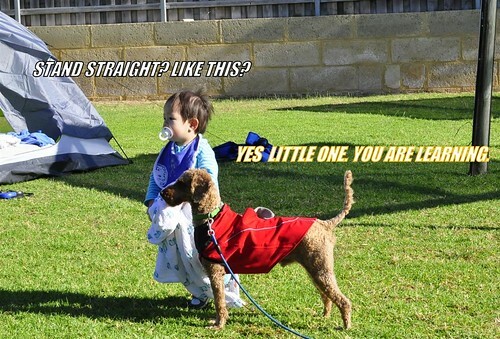 Little ones are cute during camping. 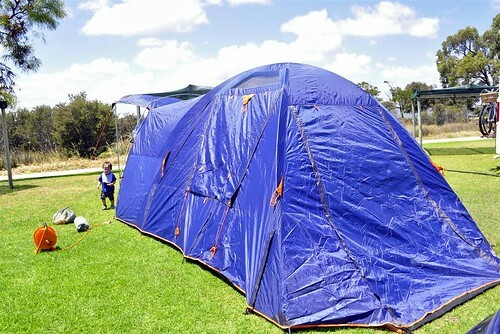 Except at night when they cry because of the funny sounds in the tent. 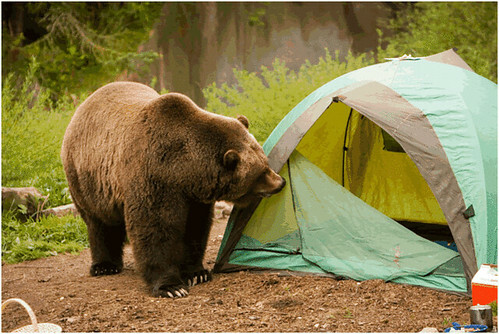 The best part of camping is spending quality time with your friends and family. Family photo for Wendy, Jason and Muffin. With another little one coming along too hehe. 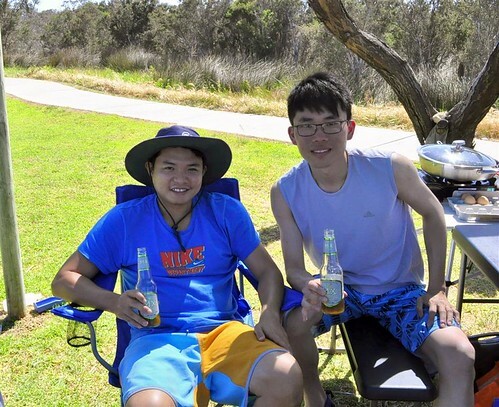 Good mates sharing a beer. First camping trip over and out! We’re already planning for the second one :). I’m told the best part about camping is sitting in the chair with a glass of wine and looking up at the stars. That is going to be my goal for the second trip! 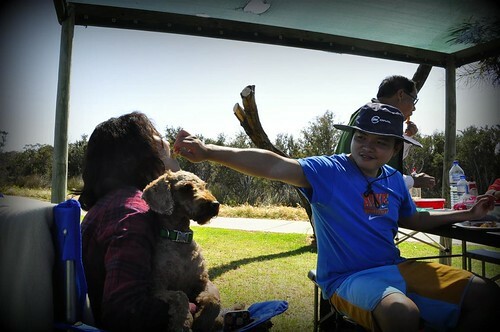 Somehow in my over decade life in camping friendly Australia, I’ve always managed to avoid camping. 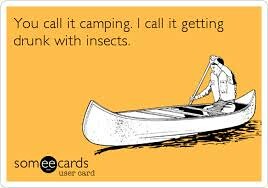 I think it’s because I’ve always known deep down inside that I’m not the camping sort. I don’t even like nature and am not the kind that yearns to go to grand canyon or wildlife parks. That’s all going to change come this weekend. We’re going camping for the first time in our lives. Even Tristan is coming along. And we’ve spent too much on camping gear to back out of it. To tell the truth, I’m kinda looking forward to a few days of no computer, being out of the office and hopefully some time by the beach. I’ll let you know whether daitaoha suits camping when this is all over. Don’t worry, no grizzly bears in Australia that I know of. Just dingos. Haha, kidding, *gulp*. Wish me luck!